India can be considered as a promising but also challenging destination for cooperation for European SMEs and cluster organisations. Although science and technology cooperation between the EU and India has been particularly strong in the past decade, cluster-specific cooperation projects have been slower to emerge. 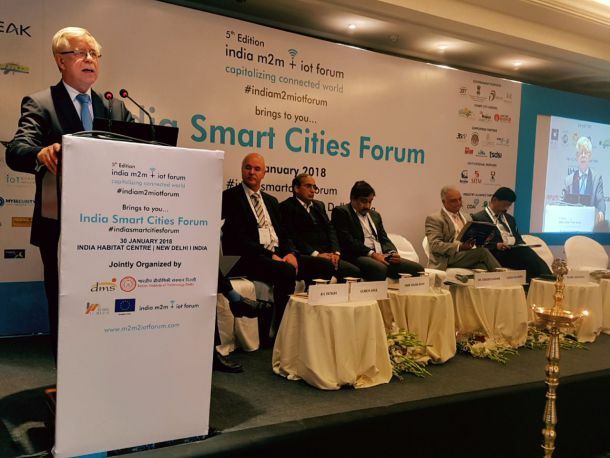 India has been mentioned as a target country by 7 European clusters taking part in the European Strategic Cluster Partnerships – Going international (ESCP-4i). These partnerships address the following sectorial topics: environmental industries and clean technologies; food packaging; IT based Smart City solutions; Transport. India is the second largest country in the world with more than 1.21 billion inhabitants. GDP growth rate in India has increased in the past years from 5.6 % in 2012 to around 7.5 % between 2014 und 2016. In 2015, India was ranked 55th in terms of global competitiveness and among the top 50 countries in terms of being innovative. Overall, India offers a dynamic economic and innovation environment and a large local market for European enterprises and research institutions. This is also reflected in the fact India is ranked as the 9th important trading partner of the European Union with a share of 2.2 % of EU’s overall trade with the world.Read less. The Cluster Observatory in India is a NGO run by the Foundation for MSME Clusters (FMC), established in 2005. The Cluster Observatory lists more than 5,000 clusters on their website. A number of clusters in India do have a formal structure. One Indian cluster received an ESCA label. A total of 29 Indian cluster profiles was available on the previous ECCP. Cluster Development is seen as a strategic tool to develop India’s economy. Nevertheless, there is no recognizable, holistic approach for cluster policy in India. Many ministries have their own initiatives to support clusters in their own field. The most holistic approach is set by the Indian Government Development Commissioner Ministry of Micro, Small & Medium Enterprises (MSME). The National Innovation Council (NInC) of India also act to catalyse and facilitate creation of innovative clusters through Cluster Innovation Centres (CICs).Read less. Cooperation between India and EU with regard to innovation and research has a long history, and was formally initiated with the signature of the EU-India Science and Technology Cooperation Agreement in 2001, and which was renewed in 2007 and 2016. The EU-India cooperation was implemented and supported through various initiatives in recent years, notably the INNO INDIGO project, the EU-India S&T Cooperation Portal, the India GATE, the BILAT EUINEC and the India SI House project. The most relevant technological subjects for cooperation projects were Scientific Research, Environmental Protection, Medicine and Health, Life Sciences, and Medical Biotechnology. The “Roadmap for EU – India S&T cooperation” identifies the main sectors of cooperation for India and the EU. These are related to clean technologies, smart cities, health & food, bio-economy, nanotechnologies and advanced materials.Read less.